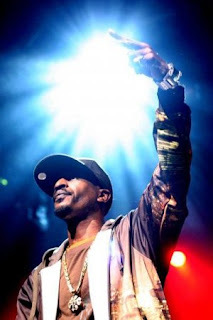 From the Google Music department... Rakim @ Emo's tomorrow, Nov 4th! Graced on stage with Rhymefest. Rakim (pronounced rah-KIM) (full name Rakim Allah, born William Michael Griffin Jr. on January 28, 1968 in,Queens, New York) is an American rapper and pioneer of the musical genre of hip hop, known as one half of the duo Eric B. & Rakim. He is consistently cited as one of the most influential and skilled MCs of all time due to his exceptional flow and complex lyrical craftsmanship. He is the nephew of American R&B singer and actress Ruth Brown. He grew up in Queens, New York, and became involved in the New York hip hop scene at a young age. Eric B brought him to Marley Marl’s house to record "Eric B. is President." At the time Griffin was fresh out of high school and on his way to college, but he decided to forgo higher education and instead chose to record with Eric B.. Leshaun and Rakim made a few hits and mix tapes together. When Griffin turned 16, he joined The Nation of Gods and Earths (also known as the 5 Percent Nation) and changed his name to Rakim Allah.